For 16 years we have been going to Scotland, if only to meet some friends and travel through this beautiful country. This year we had no idea if we could make time free and only a few days ago we planned this trip. As a result, we could only leave today by boat and not on Saturday what we actually wanted. And we sail via IJmuiden to Newcastle, not via Dunkirk to Dover, which we usually do. And when we are in IJmuiden we know why we normally go via Dunkirk: the many waiting here! We have to wait for hours until we can board the boat and also we are mostly waiting until we finally can leave the ship the next morning. These ferries are quite luxurious boats but we just want to be back on land as soon as possible and then on the road. At the crossing via Dunkirk you make a lot more mileage but I love to sit at the wheel myself. By 7 o'clock we sail through the Tyne at Newcastle but we also have the misfortune that they are having serious border controls in England and so we drive in England only at half past eleven (English time). The next time we will go through Dunkirk and then throughout England again. It is nice weather and for the Netherlands that is also predicted for the next week and a half. Usually the weather in the Netherlands comes from Scotland so who knows, we might be lucky this time, last year we had quite some rain. By 1 o'clock we enter Scotland and call the owners of the cottage that we have booked. That was the first part of the trip that almost went wrong: after booking and paying we got a phone call that the cottage was not available anymore and that they wanted to return the money (of course without the 13 pound credit card costs). And we found it very difficult to find something else affordable. After some back and forth calling and mailing, the owner suddenly realized that he still had a comparable cottage that was available. North of Perth we turn off the main road and wind through the narrower roads to Braemar, a beautiful place where we will definitely go this week. 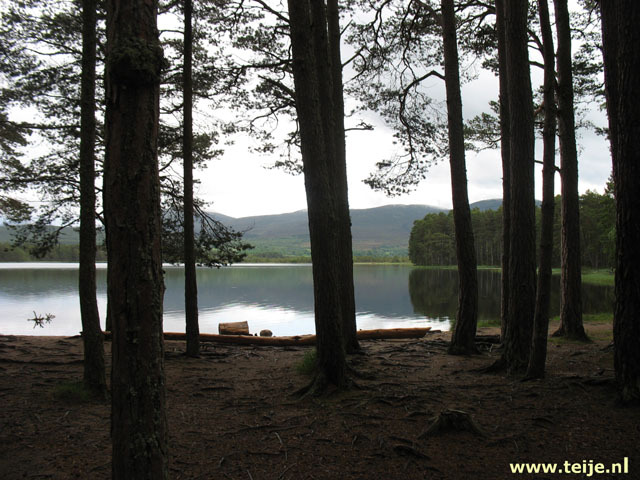 We are now on the edge of the Cairngorms national park, a large area that mainly consists of the Cairngorm Mountains. The name for the park in the Gaelic means 'Red mountains' but the area has been given the name of the mountain Cairn Gorm, which in the Gaelic has the name An Carn Gorm. And that means blue or green mountain according to the internet. so which color will it be? It is wonderful weather and with our newly purchased camera we make beautiful pictures of the clear blue skies over the brown Scottish hills that are dotted with purple heather and colorful plants of which we do not know the name. But we do not stop too often because we left Newcastle quite late and continue our journey to Strathdon where we arrive at 6 o'clock at our cottage. Just before we arrive we hear a heavy grumbling sound and we suddenly see a cargo plane or something similar flying very low, just before us, very slowly, right in front of the sun. 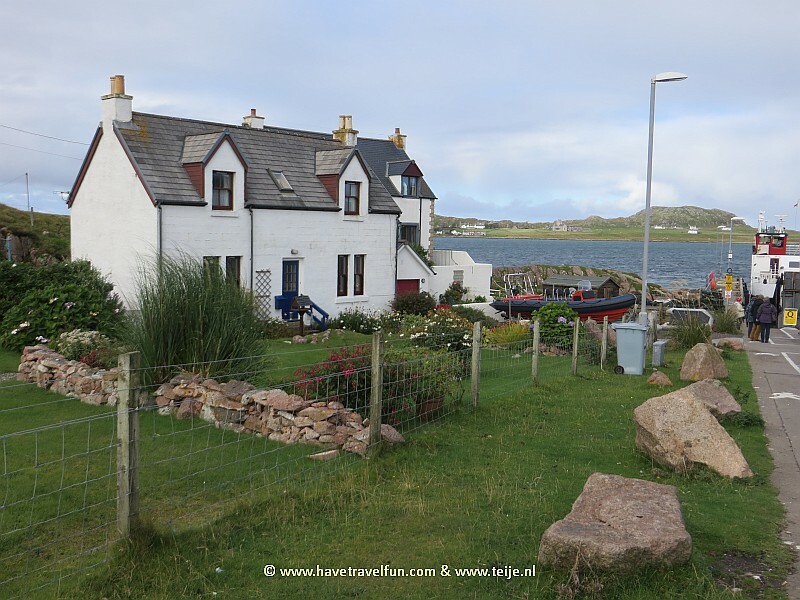 As usual, it takes some searching because they don't always use street names and house numbers in Scotland, why should you in small villages? Forbestown Lodge is nowhere indicated, but with a vague description of the lodge and the house where the owner would live, we eventually arrive. It is a beautiful, large wooden house that on the photos looked like it stoofd totally alone in nature but in reality has all kinds of neighbors. But it is beautiful weather, we have a veranda with a beautiful view and we can sit outside all night, there are even almost no mosquitoes. We already feel at home again.